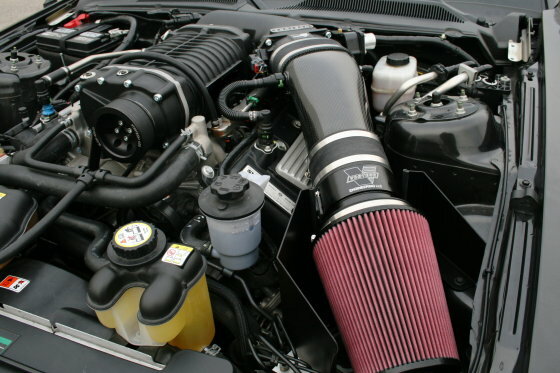 Lysholm 3300 supercharger kit (part # 3320010 - $4,495.95) with stock GT500 air intake components. Lysholm 3300 supercharger kit (part # 3320010 - $4,495.95) with optional Vortech air inlet upgrade and throttle body (part # 4LFR212-020 - $599.95) (sold separately). Download Installation Manual (PDF, 6MB): 4LFR020-010 v1.1. Designed for use with the 5.4L 4V engine in the ‘07-‘09 Mustang GT500. Features the Lysholm 3300 twin-screw supercharger with 4.0” driven pulley and new 10-rib drive belt. Compatible with “tall” fuel injectors and aftermarket fuel rails. Lysholm 3300 with optional Vortech air inlet upgrade and throttle body. Part number: 4LFR212-020, $599.95. This high-flow air inlet assembly replaces all components upstream of the throttle body. Compatible with: OEM GT500 supercharger, Ford Racing TVS supercharger, Lysholm 3300 supercharger, OEM and most aftermarket throttle bodies (except Kenne-Bell). Optional Vortech single-blade throttle body. Part number: 8T101-001, $595.95. Requires OEM ETC module and TPS sensor (removed from OEM throttle). Throttle spring clocking tool is included for ease of assembly. Billet aluminum mounting plate and spacers. Black anodized finish. Alternate belt length may be required. Pre-loaded with a safe and reliable calibration developed to work specifically with the Vortech supplied pulley, MAF and inlet components. Calibrations for both 91 and 93 octane fuel are loaded into the tool. Notes: Not smog legal. Off-road use only. Ship date and pricing to be determined. 2008 model year is currently released. 2007 and 2009 vehicles are not approved at this time.